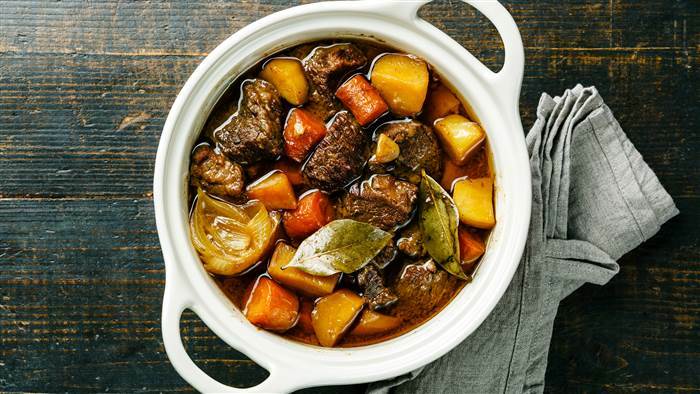 A hearty stew that makes you think of crisp, cold days up in the Highlands of Scotland and all the comfort you’ll need to get you warmed up and feeling cosy. Everything goes in the pot and finished in the oven. It’s super easy and great for feeding friends for an informal supper. 3. Add the beer and stock to the pot. The liquid should come about 3/4 of the way up the pot. Bring to the boil. 4. Add all the vegetables and herbs to the pot. Season with salt and pepper. 5. Turn the heat off and cover with a tight fitting lid.